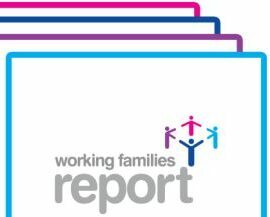 The Working Policies Annual Modern Families Index has now been published. Some of the key data has been shared and it highlighted there has been a shift in the UK from one parent working and being the ‘breadwinner’, usually the male, and one parent being the ‘caregiver” using the female, to both parents having to juggle both roles full time. With difficulty. The survey, sponsored by Bright Horizons shows that much of working parents’ annual leave is being used to cover childcare emergencies, at the detriment of time for family bonding and wellbeing. We need holidays to rest and recharge. Not crisis care manage. The report echoes much of the comments highlighted by Public policy expert Anne-Marie Slaughter as part of her now infamous Ted talk “Can we all ‘have it all’?” As Hilary Clinton’s former director of policy planning holding a top US government post she shared her personal story, claiming that “juggling high-level governmental work with the needs of two teenage boys was not possible” — and that she left her dream job to help her family. Finding the balance is a personal once to a degree but employers can take the lead and set examples of best practice knowing that when their employees feel more supported, their performance is far more likely to increase and remain consistently strong.